Here we have a meeting of two great minds, a meeting of two great spirits. Here we have deep calling deep. 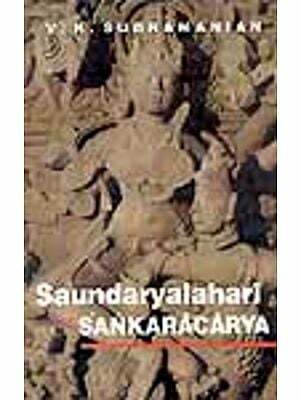 The Saundaryalahari is by Sri Sankara Bhagavatpada (Adi Sankara) and its exposition is by Pujyasri Candrasekharendra Sarasvati Svami (the Sage of Kanci, widely known as the Mahasvami). Adi Sankara is celebrated all over the world as a great bhasyakara, as a commentator of the Upanisads, the Brahmasutra, the Bhagavadgita and other texts. 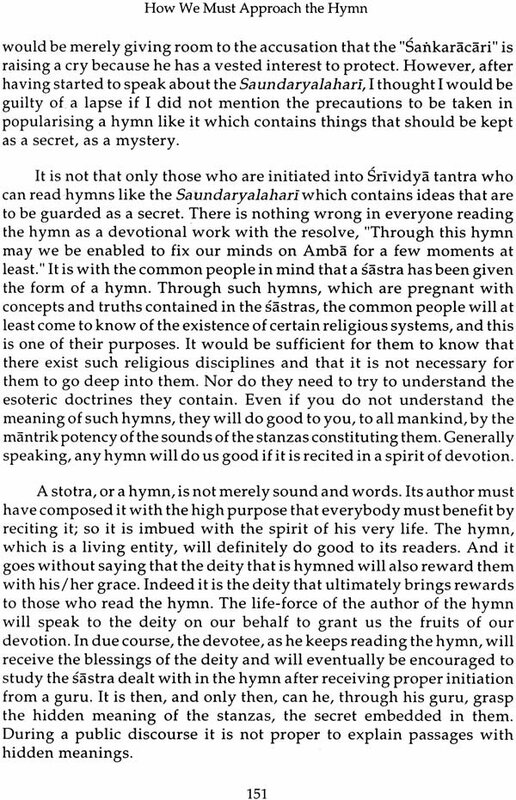 Here we have a Bhasya of a great hymn composed by the bhasyakara and what we call "an exposition" of the Saundaryalahari is indeed an inspired and inspiring work, a classic in its own right. 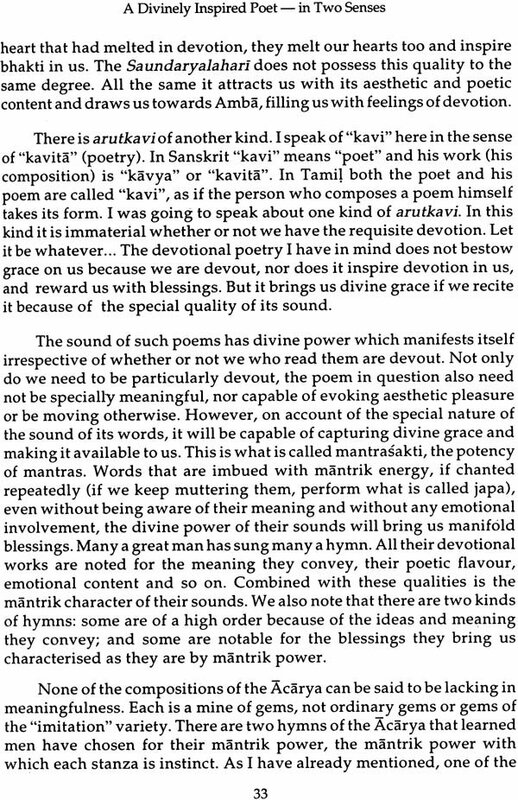 The Mahasvami speaks with the heart of a poet, with the penetrating insight of a philosopher and metaphysician and with the vision of a mystic. There are passages that move you with their unobtrusive eloquence, passages in which abstruse ideas are explained in a masterly fashion. There is poetry in this exposition; there is the fervour of devotion as well as profundity of thought that is oceanic in its vastness and depth. 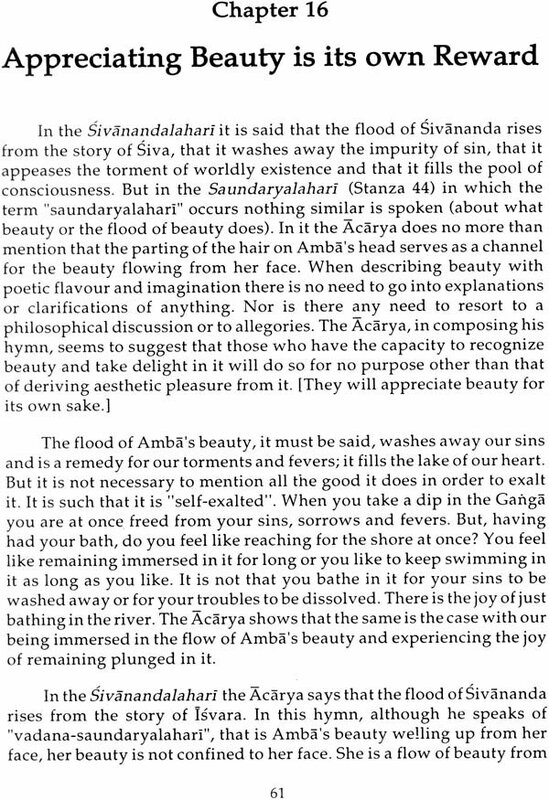 Here we have synthesis of bhakti and Jnana, of Advaita and the Sakta doctrine, when the Sage of Kanci speaks of beauty he takes you to the sublime realm of aesthetic delight. How lofty must be his mystic vision as revealed in his identification of beauty with love and compassion. 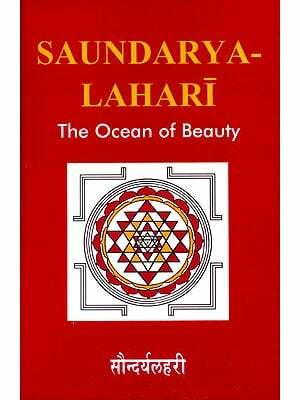 He speaks of many laharis, many waves, and his own Bhasya of the saundaryalahari is a flood of beauty that traverses various systems of thought: he harmonizes them as only he can, proving again that he is an Acarya with rare insights and with an original and creative mind. Pujyasri Candrasekharendra Sarasvati Svami (1894-1994) must be regarded as the greatest seer of our time. This gentle saint and mystic, whose life spanned almost the whole of the 20th century, created a spiritual and moral awakening in the land and made an immense contribution to its cultural resurgence. But he stood for all human civilization and he had a message for all mankind. He richly deserved the title of "Jagadguru", as one who taught in terms of the entire universe. His devotees believe that, life Adi Sankara before him, he too was an incarnation of Siva together with Amba. In these decades of struggle and turmoil, of conflict and hatred, he stood out as a luminous figure upholding the values of tolerance and charity and friendship and showed himself to be godly in his overflowing grace and compassion, while yet remaining intensely human. I consider it a privilege to write a foreword to this book which renders into English the lectures of the sage of Kanci, Sri Sri Candrasekharendra Sarasvati Svamigal, on the Saundaryalahari of Sankara Bhagavatpada. Among the great works of Bhagavatpada, ranging from mellifluent poetry imbued with bhakti to dialectical polemics, the Saundaryalahari holds a unique place. It is a veritable confluence of bhakti, mantra, tantra and, in the final analysis, of Advaita itself. Each of its hundred verses has a distinctive significance from several standpoints. 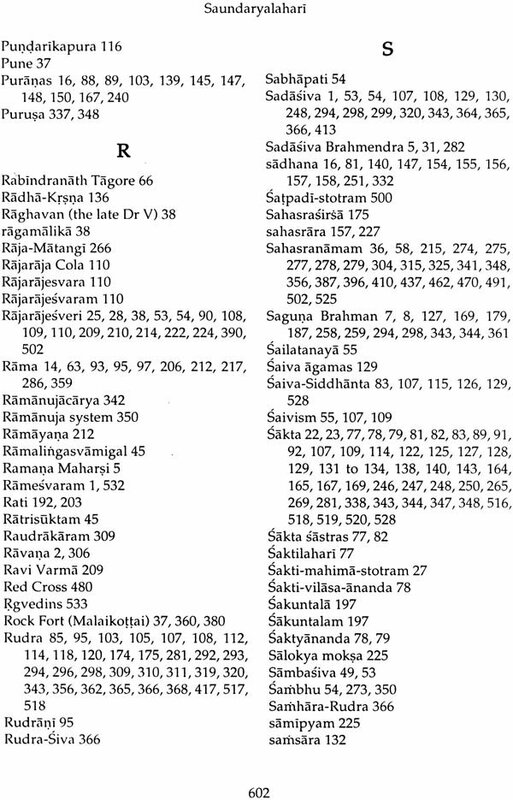 Several commentaries like Laksmidhara, Saubhagyavardhani, Arunamodini and Dind ima have attempted an exegesis of its one hundred verses. The quintessence could be brought out only by a realized soul like the Mahasvami. Devi speaks through him. Indeed, at his level, there is no differentiation to be made between Devi, Guru and Sisya. The insight one derives into this brilliant composition of Sankara Bhagavatpada through the lectures and explanations of the Great Sage is sui generis. In simple language, comprehensible to all, the Great Soul has illuminated the manifold aspects of the composition and made them radiant like facets of a brilliant diamond. The translation into English by R.G.K. is a commendable job and is reminiscent of Kalidasa's words, "Sruterivartham Smrtiranvagacchat". 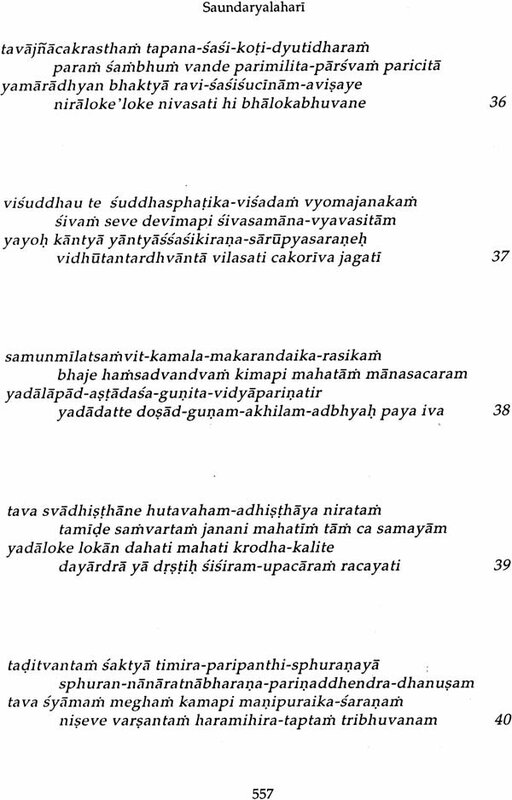 Congratulations to the translator and the Bharatiya Vidya Bhavan for making available in English the insights of the Mahasvami into the unique composition of the Great Master. A devout couple, Siva guru and Aryamba, performed severe penance before Lord Siva—Svayambhu Linga, ensconced amidst the "ghee-rock" at the hoary Vadakkunnatha temple at Trissur, the cultural capital of Kerala, for the blessing of a son. Pleased with the devotion of the ideal dampati, the Lord appeared to them in a dream and gave them a difficult choice: whether they would wish to have a son long-lived but with average intellect or one brilliant but short-Jived. They prayerfully preferred the latter. Thus was Sankara, the wonder-boy, born in Kalati, a remote village in Kerala, the foot of India. He lived for just thirty-two years. But during this brief span of life, he did the work of several long lives. His powerful mind, piercing intellect, rich personality, ceaseless activity and manifold achievements were so astounding that he left an indelible impress on the minds and thoughts not only of his contemporaries, but also of succeeding generations, and it is very much in evidence even today. In fact, his name and fame, and profound thoughts and amazing organizing power, will influence the Jives and work of untold generations to come. Verily they are immortal. History provides the example of another outstanding personality, Alexander the Great, who also died when he was thirty-two. One is struck by the polarity of power that existed in these two outstanding personages. One was the son of a king; able, strong, powerful and thorough; the other, the son of a humble, pious Brahmin, no possessor of any worldly wealth or power worth the name. Yet what a world of difference! One is grudgingly remembered by students who have to cram their pages of history; the other, honoured, revered and eagerly studied by millions the world over. One was the monarch of what mortal eyes could survey-men, wealth and territory; the other, the monarch of the mind, heart and spirit of men, too subtle for mortal eyes. Why was the success and impact of the one ephemeral while that of the other eternal? The answer lies in the motivating forces behind the careers of these two Greats. One was fired by personal ambition to become the temporal leader of people and the ruler of the mundane world; the other, imbued with that divine compassion which exerts in the direction of providing enlightenment to the ignorant and suffering humanity, blossomed into a moral leader, a mentor of mankind and the spiritual ruler of the world. The former exemplified the success of physical power which is transient; the latter typified the triumph of soul-force, which is undying, everlasting. One became a World Conqueror for a brief time; the other a World Teacher-Jagadguru-for all time. When Sankara took birth, India was wallowing in the dark pit of decadence. Buddhism and Jainism had lost their pristine glory. Corrupt practices had crept into the Buddhist fold and the viharas tended to be no spiritual retreats at all. Later followers of the Buddha revelled more in the refutation of the doctrines of other faiths than in the inculcation of anything positive. Simyavada had become something incapable of affording any constructive guidance to people. Nor could people turn to the existing modes of Hinduism for solace and purposeful direction. In the name of the Vedas, the various sects of Hinduism had tried to propagate travesties rather than truths of the Vedic religion. The benign gods and goddesses were transformed into bloodthirsty ones, grovelling in the mire of sensuality and lust and demanding awesome, cruel and barbaric homage from their misguided devotees. 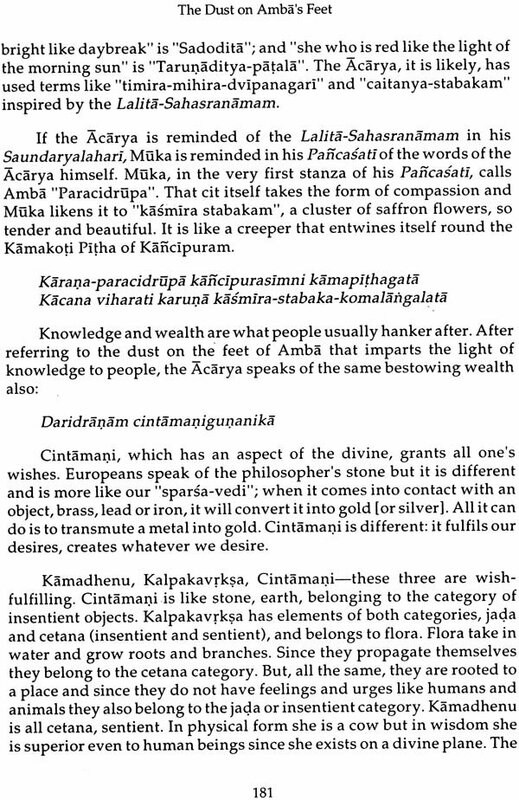 atyanta-viruddhanekarthatvena grhyamanam upalabhya-"Finding the texts being interpreted in all sorts of contradictory and conflicting ways". It was to silence the impostors who deliberately twisted the texts that he wrote the epoch-making Presthanatrayi Bhasya and his other illuminating treatises. The Bhagavatpada's revolutionary and rational commentaries dealt a blow to the nihilistic Buddhists and the misinformed Hindu interpreters. Sankara gave to the body of these texts the coherence of a system and thus won wide acceptance for his doctrine. He was no escapist retiring into his shell or into a cave in the forest. A man of amazing energy and vast activity, Sankara, in the words of Prime Minister Pandit Jawaharlal Nehru, was "a curious mixture of a philosopher and a scholar, an agnostic and a mystic, a poet and a saint, and in addition to all this, a practical reformer and able organizer." That invisible but strong bond unifying India, which is discernible to any student of Indian history, is the edifice built on the firm foundation of an intellectually unassailable and unified system of philosophy known as Advaita Vedanta. Kerala is the land of coconuts and bananas, of the ancient matrilineal system and of Namputiri Brahmins who, even among the Brahmins of India known for their learning and religious devotion for two millennia, are still one of the most orthodox, if not the most learned. It was the homeland of one of the greatest religious leaders in history. 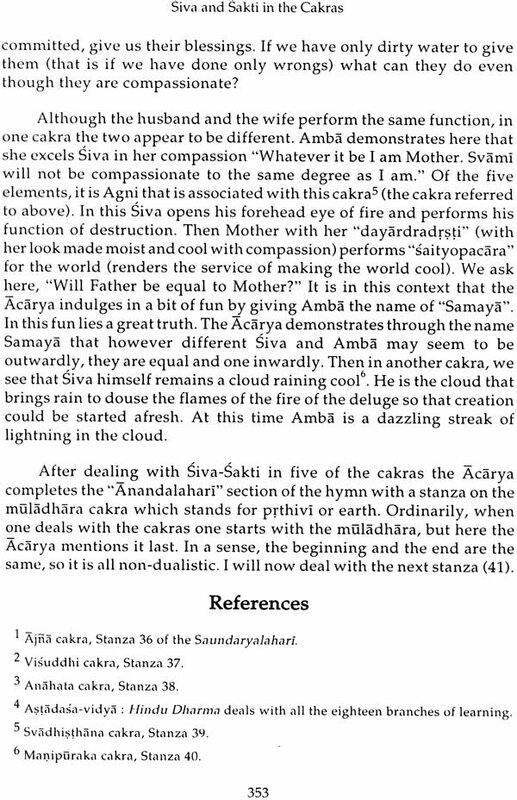 Centuries ago, a boy, named Sankara, was born at Kalati to Sivaguru Vidyadhiraja and his wife San or Ambika (Aryamba). He was a child prodigy. At the age of five, he was invested with the sacred thread, which accorded him the status of a Brahmin, and in almost no time he mastered the four Vedas. Once, while Sankara was bathing in the Puma river, his leg was caught in the jaws of a crocodile. Just as he was being dragged away, he asked his mother to permit him to become a sannyasin. The mother could not deny what seemed her son's dying wish. She agreed to his wish and he was miraculously saved from the crocodile. And Sankara, at the age of eight, became a sannyasin. In the moral, religious and spiritual evolution of man, inspired ascetics have, in the East as well as in the West, played a vital role. Their lives, more than their actions and words, have inspired millions to rise above the sordidness and vulgarity of animal existence and to walk on the path of godliness. From preterhistoric times, India has been the home of many an ascetic order. The famous Mohenjo-daro seal dating back to at least 5000 years ago, depicts Pasupati sitting naked in a yogic pose. The Vedas mention long-haired ascetics - Lord Siva sitting on Mount Kailasa, besmeared with ashes, is appropriately their guardian deity. These orders have played a great part in recreating from time to time the religious life of the people and purging it of dross, and their influence has also spread to many other parts of the world. According to tradition, the pre-eminent among these orders, was founded by Sukadeva, the ascetic son of Veda Vyasa, who, as the foremost prophet of our race, and, as the author of the Mahabharata, still dominates Hindu religion and thought. Later, Mahavira, who lived centuries before Christ, became the head of another ascetic, order, which still keeps Jainism alive. Again, the Buddha, in the same period, was the founder of still another ascetic order which today is prevalent in many countries in Asia from Sri Lanka to Japan. Sankara was initiated into sannyasa by Govindapada, a very learned sannyasin, who lived in a cave on the banks of the Narmada. Under Govindapada, the child prodigy mastered all the religious and philosophical texts known at the time. At the same time he also became steeped in the doctrine of Advaita or non-dualism. Hinduism, which time and again has influenced the religious life and thought of not only Asia but also the world has a harmonizing lesson derived from the Presthanetreyi: three great scriptural works, the Sruti (the Vedas and the Upanisads), the Gita and the Brahmasutra. These ancient scriptures teach that the goal of life is liberation, that is, freedom from the fetters of ever- recurring birth and death and from the misery flowing from this cycle; that this goal can be attained only by realizing the Brahman, the Absolute, in individual life by means of super-sensory perception which can be developed only through bhakti or devotion, or jnana, the cognition of Reality - or through karma, rituals or actions without greed, hate and fear. Under the inspiration of his master Govindacarya, Sankara, at the age of sixteen, reinterpreted the three great scriptures, the Upanisads, the Bhagavadgtta and the Brahmasfitra. His commentaries, characterized by profundity of thought and unassailable logic, recognise the Vedas as the supreme and infallible authority and expound the doctrine of absolute monism or Kevalad vaita which re-establishes the Ultimate Reality at the very centre of philosophic thought. First, the Brahman, the Absolute, is Reality, sat-cit-ananda, existence, consciousness, and bliss. In the Absolute Brahman the distinction between the knower, the object known and the knowledge is dissolved. 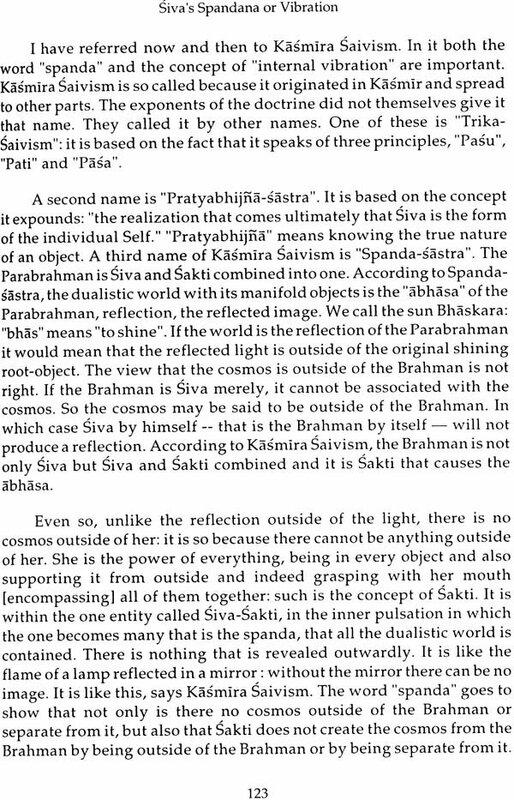 Secondly, the only way of realizing the Brahman (i.e. 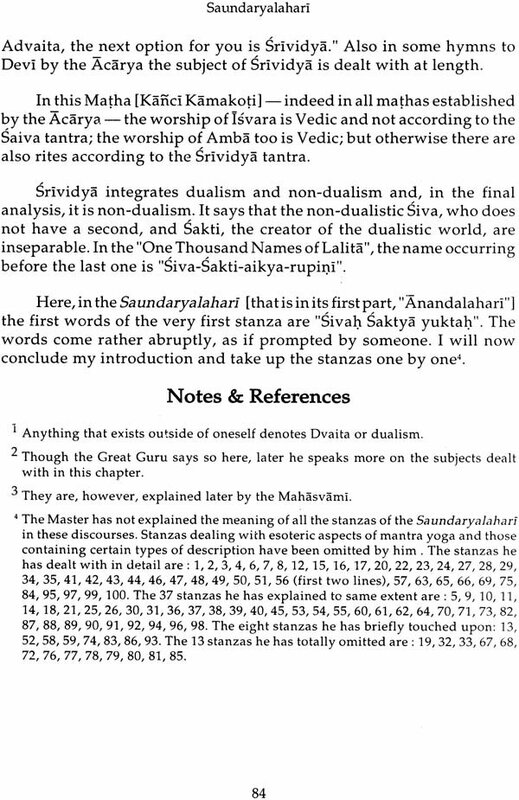 saksatkar a) is jnana, the cognition of the Reality. This cognition leads to the realization of the Absolute without the duality of happiness and misery, time and space. The world though not unreal so long as we are in it and of it, becomes irrelevant and illusory once we have the experience of the higher perception. Thirdly, to attain this supreme realization of the Absolute, a fourfold path has to be followed: viveka, right discrimination between the permanent and the impermanent, the real and the unreal; vairagya, detachment from the sensory attractions leading to the extinction of desire; sama, dama, uparati, titiksa, samadhi and sraddha - calmness, self-control, detachment, endurance, creative concentration and faith and, above all, mumuksuta, the sustained urge to attain liberation and the resolute will to shed human limitations and realize the Absolute in life. Fourthly, bhakti or devotion is only a step to secure the grace of God which will obliterate the distinction between the aspirant and God; and so is karma, action without attachment, or rituals, which bring that purity of mind which leads to the higher state of jnana. This revolutionary interpretation of the scriptures was a challenge to the Buddhist and the Jaina doctrines as well as to some of the Hindu cults that were at war with one another. It also helped to combat the gross worldliness engendered by the prevailing crisis of the spirit. Sankara, one of the greatest philosophers in history, was also a man of action. He was not content with teaching a new doctrine, he wanted to transform life in India. In our land learning was the most honoured of attainments, right till it received the impact of the industrial West. Even in the age of Sankara, religious and intellectual life in so vast a country as ours was highly organised. On account of the training and discipline which the Brahmins, as a community, received, the bulk of them were family priests, astrologers, or physicians in the villages and the towns and at royal courts. Besides there were those who specialised in grammar or literature, rituals, traditional history, logic and philosophy. They were of all grades, from a village teacher to the savant and the sannyasin who travelled from place to place and were received with high honours wherever they went. The eminent among such scholars, from time to time, met to hold debates under the patronage of royal courts, at which even learned kings presided, and the victors in such scholarly tournaments were given royal honours, and they were often carried in triumphal processions. But to be pre-eminent one had to receive recognition from the scholars who lived in a few centres of learning, of which Kasi or Varanasi, was the most notable.